I know it’s all part of the political process, but there’s something so amusing to me when politicians have to don costumes to profess an interest in community happenings. 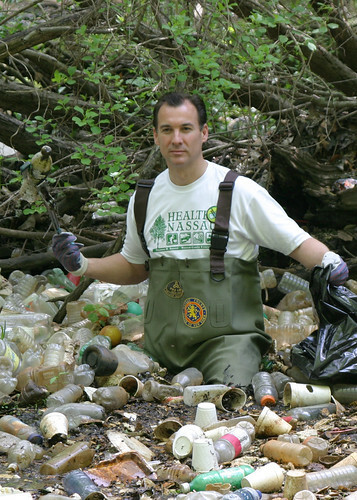 Nothing makes me giggle more than the likes of Tom Suozzi wearing hip waders in a sea of garbage, or Steve Levy touching the top of a solar array as if being able to feel the energy emanating from it. My all-time favorite is seeing any of our public servants in a hard hat, as if their union card is at the ready and they are prepared to singlehandedly hoist a steel beam several stories into the air. I think when you’re elected you actually get a pair of giant scissors in the event a ribbon-cutting ceremony breaks out. Several years ago I ran an ill-fated campaign for mayor of Glen Cove. Truthfully, it was a blast and I wouldn’t trade the experience for anything. Just meeting everyone in the city and learning how roads are paved, where garbage goes and who answers the call when the alarms go off at the firehouse is enough to light my candle. Putting my family through the misery of a campaign, on the other hand, was an unfortunate way to gain the education. What got me thinking about the shenanigans of the campaign trail and the silly things politicians have to do to stay elected was a piece of campaign literature from my mayoral run that I came across recently when cleaning out my garage. There I was, standing on the beach at sunset wearing a suit. Why not? What else would any self-respecting office-seeking candidate wear on a warm summer day at the beach? Yet beyond the hard hats, giant scissors, Michael Dukakis helmets and Cub Scout photo ops is the timeless Tip O’Neill saying that “all politics is local.” It’s shoe leather that wins the day in a campaign. Proof positive of this is yet another colossal upset in Suffolk County under the stewardship of Democratic Party boss Richie Schaffer. Schaffer once again upended the expectations in Brookhaven and got an unknown candidate elected to Brookhaven Town Supervisor. They did it the old-fashioned way: by knocking on doors and connecting with people. Having my own brush with the process I can honestly say there is no greater truth in politics. In fact, it may be the only truth in politics. Knocking on doors, however, is its own box of chocolates: You never know what you’re going to get. For example, my fellow candidates and I were surprised to learn how many men answer the door shirtless. When walking on a Sunday (in the narrow window between church services and baseball), we learned that knocking on the front door in the Italian district was pointless. Now, check the side door entrance to the basement and you’re likely to find dozens of people of all ages streaming out of the house like a clown car. This is how I learned that Italian Americans don’t actually cook in the kitchen; that’s what the basement kitchen is for. Politicians who walk in wealthy districts do so at their own risk. Alternately, the poorer the neighborhood, the more likely you are to be invited in for a meal. This is a perilous tactic that assaults a politician’s time and waistline, necessitating yet more walking. There are hundreds of observations to be made about our culture and our neighborhoods when walking door to door in a political campaign, each one more valuable than the next. At the end of the day it’s the only way to learn about the community you strive to represent. It’s also the only way to earn people’s trust first and their votes later. And if you work diligently enough, you too will be awarded with a giant pair a scissors, a hard hat and an undying respect for the people you represent.